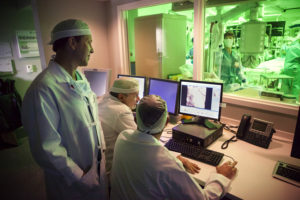 These capabilities include minimally invasive valve and bypass surgery, advanced aortic surgery, including endovascular as well as complex root surgery, mitral valve repair, and robotic-assisted cardiac surgery. 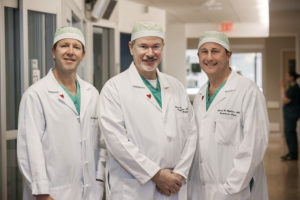 “We pioneered minimally invasive techniques with both mitral and aortic valve replacement procedures here in the Delaware Valley,” says Michael Rosenbloom, MD, FACS, FACC, FACCP, codirector of Cooper’s Heart Institute and head of the Division of Cardiac Surgery. In fact, a large percentage of Cooper’s cardiac surgery volume—one of the largest in the region—is made up of valve procedures. Of these, nearly all of aortic valve replacement surgeries and most of the mitral valve procedures are performed minimally invasively using a non-sternotomy approach that dramatically lowers complication rates and results in less pain and faster recovery. Cooper also pioneered endovascular valve replacement in the region. Notably, Cooper was the first commercial site for the Edwards SAPIEN transcatheter heart valve as well as the only New Jersey hospital to participate in the subsequent PARTNER II clinical trial, making the next generation of transcatheter aortic valve replacement (TAVR) technology available—extending its application to patients at moderate risk for surgery. Today, Cooper not only has performed more TAVR procedures than any other hospital in the South Jersey region but also is one of the highest-volume sites in the nation. Mitral valve repair is another area in which Cooper excels. It is a highly specialized area of expertise in that the majority of mitral valve repair surgeries in the U.S. are performed by a small percentage of cardiac surgeons. While all Cooper’s cardiac surgeons are facile with this procedure, Dr. Rosenbloom is a nationally known expert, having performed mitral valve repairs for nearly 30 years. “It’s my main passion in cardiac surgery,” he notes. As a result, a patient with a leaking mitral valve has a better chance of having it repaired at Cooper versus replaced, resulting in less stress on the heart muscle. This, too, is performed minimally invasively whenever appropriate, translating into a shorter length of stay and faster recovery. Cooper’s approach to coronary artery bypass surgery (CABG) is on the leading edge, too. Frank W. Bowen, III, MD; Michael Rosenbloom, MD; and Richard Highbloom, MD. Further, he notes, his team is performing some single, double, and sometimes triple bypass procedures minimally invasively, with and without the daVinci robot. Patient outcomes are the ultimate measure of Cooper’s cardiac surgery expertise. Accessibility to this advanced care is streamlined with a single call to the Cooper Transfer Center that provides 24/7 air and ground transport (855.284.9337). or call 856.342.2034 to refer a patient.